A $200 drone in today’s market is going to be at the higher-end of the toy class quadcopters. At RC Hobby Review, we extensively review the best quality drones out right now. Today we will be looking at some of the best drones under $200. When contemplating the purchase of a quad, you should consider a few different factors. One factor is cost and another is your experience with flying UAVs. You might not want to immediately go out and purchase a $1000 drone until you get some flight experience with a low cost drone under your belt. There are many quads available on today’s market that run in this price range and below that have excellent camera quality and good battery life. In this review we will be looking at the top quads in this price range that you can buy today. If you're buying for a child, consider checking out our best drones for kids review. One popular use for drones is for film making and YouTube videos. Many drone enthusiasts have played a huge role in increasing the popularity of the hobby because their videos featuring footage are very entertaining to a lot of people. Having a drone allows you to add artistic shots to your videos that you would not have otherwise been able to achieve. Below is a great list of drones that you can appreciate. Finding a great quadcoptor can sometimes be a chore, but this compatible Go Pro drone comes with brushless motors for better power and speed, ensuring you're getting your full money's worth. It is sold with 2 batteries alongside 2 shells. With the batteries, your fly time is doubled. It also comes fitted with a 1080p HD action camera that guarantees picture and video quality. It has a camera mount for ease of use and operability. If you have a GoPro Hero 3 or 4, you can also use it for video recording. It allows a control range of 500 meters, which is impressive for such a drone. For 100 percent control of the drone, you will need the 2.4 GHz remote controller. The RC Racing quad comes with a 2.4G remote control for reliability and ease of monitoring. It features an ABS+Electron component as the main material and an anti-collision technology. It has a USB plug charger that you can use to keep your bugs 3 powered for effective usage. It supports 3-D flipping and it can roll up, down, forward, backward, and can turn left and right for a convenient flight experience. The B3 Mini features a control distance of about 200m, which is ideal for beginners and practicing drone enthusiasts. It has a 7.4V 850mAh lipo battery that gives it a longer flight time for you to enjoy the thrill. This guy has a flying time of about 10mins that is great for perfect hovering. When the battery runs out of charge, the charging time is about 180mins (3 hours). It is also operated with a 4 * 1.5V AA controller battery that you can get separately. It weighs approximately 186g, which makes portability easy and renders the model ideal for traveling. It is 220 * 220 * 65mm in dimension, which makes its design compact for storability. It is designed with 4 bright LED lights that will give you an amazing time as you fly at night. Once you place your order, you will receive a B3 mini racing drone, a remote controller, 7.4V 850mAh Li-Po battery, 4 propeller protectors, 4 spare propellers, a USB charger set, a blade changer, a screwdriver, and a user manual. A great drone at this price point. The bugs 6 features a diagonal wheelbase of 250mm and a GR303B flight controller. The manufacturer uses pure nylon fiber to make the frame for flexibility, making it resistant to smaller crashes. It has a gross weight of about 370g, which makes it light enough for travel. The flying time is between 10 to 12 minutes hovering while the flying distance is about 200 to 300 meters. That long flying time is facilitated by the 7.4V 1300mAh 25C Lipo-battery. The long range is supported by the reliable 2.4G frequency technology that is super responsive. It can handle a top speed of 80km/h for reliability, especially for aerial photographers. 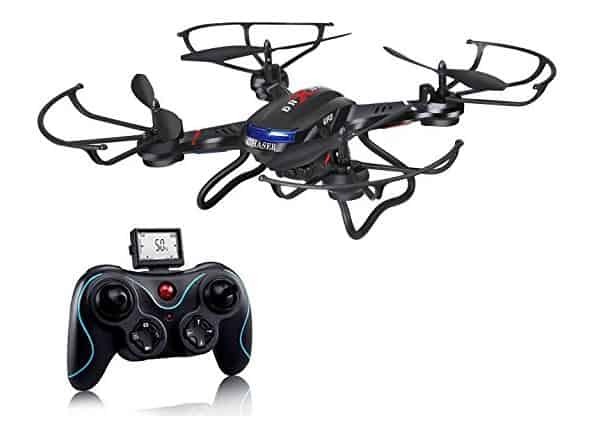 It comes with an upgraded C5830 FPV camera that takes high quality images and videos. The FPV TX is 5.8G 500mw, and it has a 5.8G Antenna. This drone is able to make 3D flips and rolls. All you need to do is press the 360° rotation button and you will readily control its movement on all 4 directions. The LED searchlights on the DROCON Bugs 6 Drone are bright enough to give you a heart-stopping flight moment. For great speeds and strength, DROCON Bugs 6 drone is built with 1806 1800 KV brushless motors. The radio control innovation on this drone is two-direction 2.4GHZ. This means that you will still receive alerts even with low voltage or a weak signal. This will allow you ample time to attend to the issue before flight time. The brushless motor enhances its battery life, and they do not heat up. This drone is quiet, easy to fly, smooth, and fast. The price is friendly for a drone that comes with fully enclosed motors and gears. The motor tends to be problematic when flying and it may fall after a short period of use. Yuneec Breeze is one of our proud picks and it stands as one of the superior drones in the industry as it comes with a well-defined HD camera that has a 4K ultra high resolution and ultra-clear 13 MP stills. This ensures that you take breathtaking images and videos. It features 5 automated flight modes that you can opt for as you take your shots. These include Selfie, Pilot, Orbit, Journey, and Follow Me. The self-defined modes make the drone one of the top choices for beginners and kids. It has a built-in Indoor Positioning System that allows it to stay in the required position both outdoors and indoors. The propeller protectors on the Breeze are made to prevent it against collisions with other objects. Another fascinating feature is the return to home function that enables it to come back to you automatically. You can also land it by simply tapping a button! You can also download an application on your phone to help control the drone better during navigation. The phone will help you track the drone once on flight. The app also allows you to edit the images and videos captured. It also makes it easy to share them with friends. 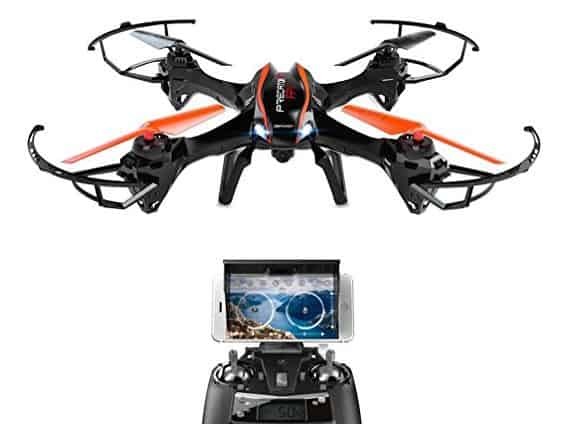 Moreover, you will get a Camcorder Remote Control once you purchase the drone. It weighs approximately 3.3 pounds, which makes it light enough for travelling. It comes with 2 Lithium Polymer batteries that will increase your flight time without needing immediate charge. The flying time is 10 minutes and it can go to a control distance of about 200 meters. It is easy to use and fly. Auto landing and auto return home features make it safe to fly. It is light for portability and compact for ease of storage. After only 3 charges, the battery may become useless. It has no GPS acquisition. It loses Wi-Fi connectivity if flown over 150 meters. The drone comes with a 720p HD camera that will enable you take some pristine aerial videos and pictures. The wireless monitor screen is 2.4 GHz, and it will ensure that your flight yields an attractive scenery for the live recording. It has an air pressure sensor that features a headless system as well as an altitude hold function. This ensures continued stability for aerial recordings despite the height of the drone. 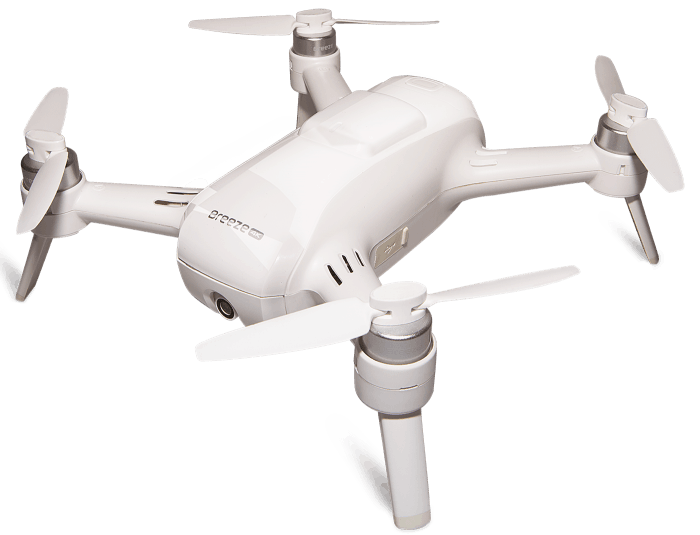 It also has an altitude hold mode where you can set the drone to fly within a specific altitude for better shooting. This is convenient, especially if you want the images at an angle. As a result, this drone is an excellent choice for the intermediate hobbyist and beginners. The take-off and the landing of this drone are controlled with one key. This renders it easy to run regardless of the level of training you are in. 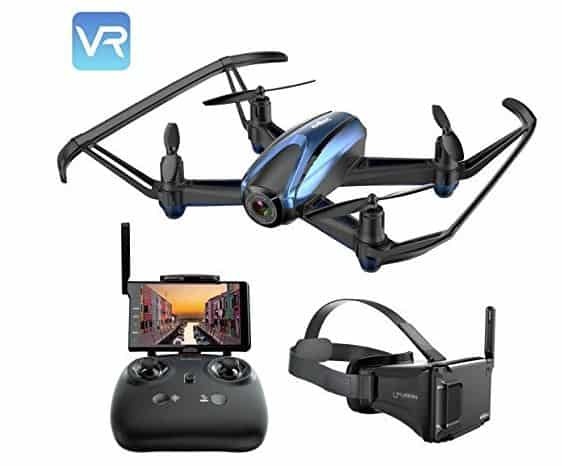 You will get a transmitter, VR glasses, a monitor, 2 batteries, a battery charger, a separate monitor charger, assembly tools, and 4 propellers alongside the drone. When this drone goes low on battery, a beep alert sound will be heard to allow you ample time to bring it back before it gets lost. It has a control distance of about 200 meters, which suits the needs of beginners. The flying time is about 10 to 20 minutes making it clear why it made our list. It comes with double batteries for a long flight moment. The control distance is short. The F181 RC Quadcopter Drone is currently a great FPV drone under $200 with a camera, if you are searching for an affordable quadcopter. This drone features an HD camera that takes clear photos. It also comes equipped with a cooling network inside the motor to prevent overheating while in flight. 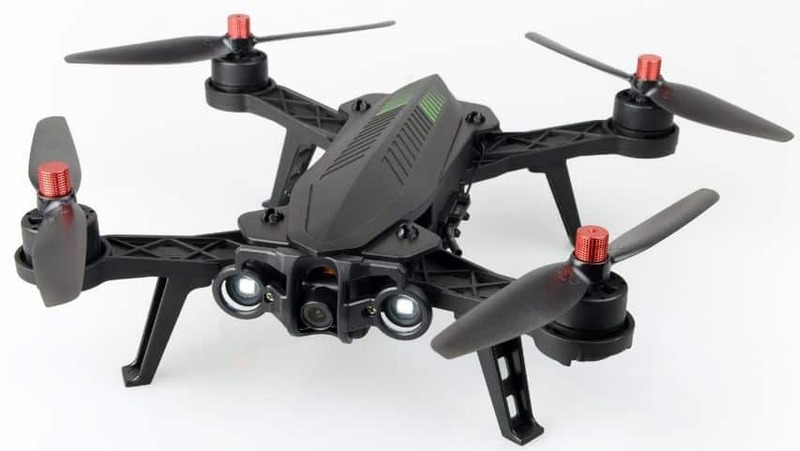 In addition to these features, The F181 RC Quadcopter Drone also is equipped with a stabilizer, which makes it more easily maneuverable and stable so it can be flown both indoors and outdoors. It also has bright LED lights that make it easier to locate your drone at all times. When moving forward, the LED lights are blue and when moving backwards, they are red. This is incredibly useful when you are flying at night. The 2MP camera allows you to record videos at 30 frames and take pictures that are 720p resolution. This camera is not professional quality. However, it is about the average quality that you will find with drones in this price range. The 2 GB card that comes with the drone should be sufficient to store all of your footage. Also, the controller resembles many game console controllers, such as Xbox, which is what you will find with many quadcopters due to its overall familiar controls. This specific model also comes equipped with an Altitude Hold Function. 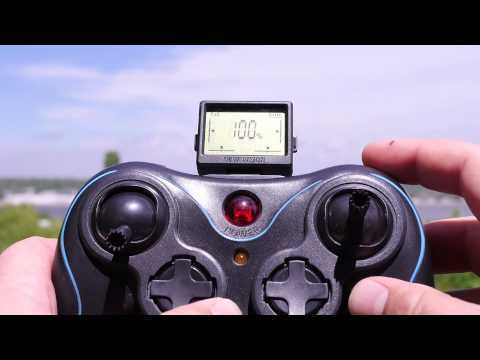 This allows you to release the throttle stick without affecting the altitude of the drone. It will remain at the same height. This makes it easier to capture photos. The range for this drone is approximately 50-100 meters. The average battery life is 7 to 9 minutes and the charging time is around 80 minutes. One con of this drone is that it does not have FVP. Essentially, this means that you cannot view the footage live from your smartphone or laptop. This is somewhat disappointing but it isn’t necessarily a reason to not purchase this drone. It still has many positive attributes. Another con to the Holy Stone F181 RC is that it has a slow yaw, meaning its right and left movements are not very fast. However, this is common with many drones within this price range and is usually to be expected. This drone comes equipped with many features and an extra battery, screwdriver, blade protectors and 2 USB charging cables. Having an extra battery is very convenient because when one dies you can simply insert the other to continue flying. However, it is recommended that you wait approximately 10 minutes after the battery charge in order to avoid overheating the motor. The fact that this drone comes with blade protectors is another pro. Blade protectors aren't necessary for the overall function of the drone, but if you're a beginner it is advised that you use them. This is because when starting out, it is likely that you will crash your drone at least once and having the blade protectors helps you avoid significant damage to the blades. Overall, this is an excellent choice for many individuals because it is very affordable and offers a lot of unique, high quality features for it's price range. For all of these reasons, this is one of the top drones in this price range you can buy today. 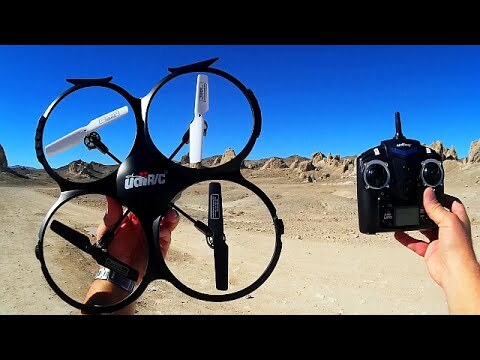 ​For an overview on how to operate the Holy Stone F181 Quadcopter see the video below! The DBPOWER UDI U842﻿﻿ Predator is a very durable drone. It also has a very fast charging battery, which is an incredibly convenient feature. It is one of the top drones you can purchase in this price range. It is built to withstand rough landings and comes in very unique color combinations. The UDI U842 can be flown with a standard controller or app. When using the app, you can control the drone by simply tilting the camera angle via the gravity induction mode. This drone is designed to fly well in light wind conditions and can be flown both indoors and outdoors. The battery life of this quadcopter is very good and it also features RTH functionality and headless mode. This drone does, however, have several cons such as, mediocre hovering mechanism and propeller guards, mediocre video and lags during real time FVP. Overall, this drone is stable, easy to control, has decent camera quality, comes with an extra battery as well as a memory card. All of extra features help to make it a top drone on this list. For a closer look of the DPOWER UDI U842 Predator check out this video review! The UDI 818A HD drone is an excellent, affordable drone. Arguably, it is one of the best quadcopters available in this range. It offers an HD camera. Having a high quality camera can really come in handy, depending on what type of footage you are shooting. If you are looking for a drone that will offer you high quality footage, this may be a good choice for you. This drone is definitely worth considering. Another great feature that the UDI 818A HD offers is a return home feature. 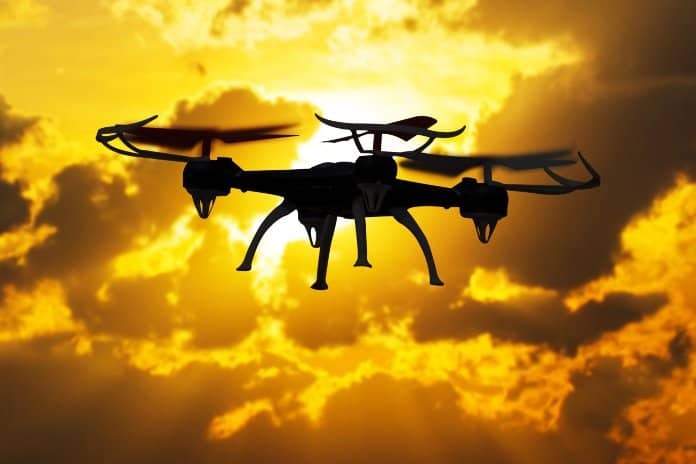 This means that if the battery is running low, the drone will automatically begin to make its way back to you by following the signal from the transmitter. This is a really helpful feature because you could potentially have trouble locating your drone if the battery dies or it could die somewhere really inconvenient, such as in a road, where it could be damaged. 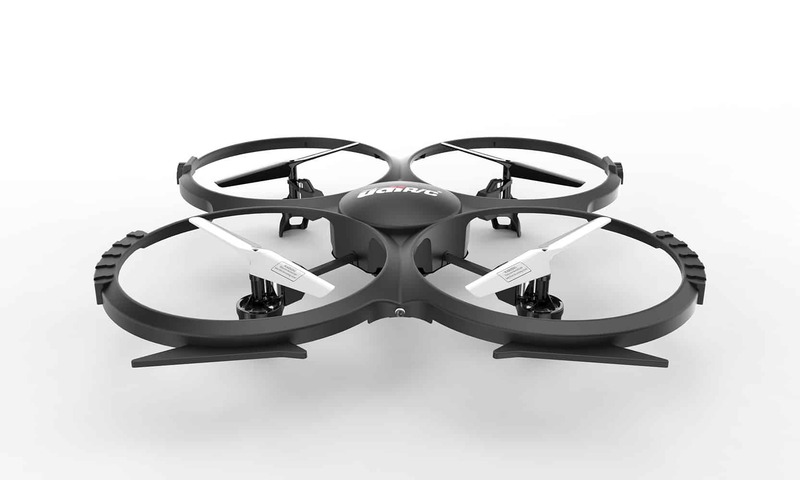 This drone features propeller guards which can come in handy in a lot of instances. This makes the drone much safer to fly around other people, in comparison to drones with exposed propellers, which can cause injury. The thin plastic material used to produce this drone has many benefits. The material essentially allows the drone to withstand a lot of abuse. You would think that it would be the opposite and the flimsiness would cause it to break easily. However, this is not the case because the drone can withstand a lot of situations you would think would damage it. However, this drone does not withstand moisture very well, so that is something that you will need to keep in mind. It is probably a good idea to not fly it during wet weather conditions. It is also not recommended that you fly it above concrete or asphalt. The first few times you are flying it, it is a good idea to try to find an open, grassy area such as a field. It is also a good idea to avoid flying it during high wind speeds because this may cause you to lose control of the drone. Another tip is to not fly it too closely to trees because it may end up getting stuck. An interesting feature of this quadcopter is its 360-degree aversion maneuver. To perform this maneuver you simply press the 360 button while the drone is in flight and it will automatically perform a 360-degree flip in the air. Some cons of this drone would be the somewhat lackluster video quality, its short battery life, and how lightweight it is. This drone does features two speeds, low and high, or mode 1 and mode 2, which can be a plus for beginners. The camera produces images of 1280 x 720 resolution. Overall, this is an inexpensive drone that offers a lot of positive attributes. It is currently number 24 on Amazon’s best-selling toys and games list and it is definitely worth considering if you are purchasing your first drone. That's why it easily makes our list. Finding a quality drone under $200 can take a little research. Perhaps you're new to the drone hobby, and you don't want to pay $999 for a drone. Luckily, you can find many entry-level drones for between $100 to $200. Anything below this price will may not be worth the cash paid, unless it comes from our recommended lists. These drones, however, are some of the top available, and they take good pictures and videos. However, for those who want professional quality in their videos and pictures, they will most likely have to pay a little more. A lot of people buy a great new drone because they want to get into snapping awesome aerial photos. For this, you will need to practice, and you will also need to pay close attention to the level of quality. If you have a $1,000 budget, then you have plenty of options out there, but if you don't have that budget, then you have to pay extra attention. For example, you will want a good camera focal length with the drone. For beginner drones, they usually won't have the filters, interchangeable lenses or professional features. The camera comes down to your specific project needs. A real estate video will usually want footage that's easy on the eyes, but with extreme sports, you may want the fisheye look. You might feel tempted to go out and buy a drone with longer flight times and longer range. However, drones are notorious for being hard to fly for beginners. You want a beginner drone because it can endure minor crashes more easily, and you can buy spare parts for it more easily and at a lower price. A beginner drone helps you to get your feet wet and learn flying a drone. Hobby drones are usually seen as the next step up from a beginner drone. They will be more affordable than the professional drone and more durable. Another advantage of them is how they will often include more advanced features and a longer range. A camera or professional drone will usually cost you more, but they will have all the advanced features you need. This drone lets you participate in aerial photography, and they should come equipped with a great camera. Many times these drones will also use GPS tracking so that you can find them if lost. Also, you have a return home feature, which will also make them easier to find. Finally, you have racing drones. These amazing drones have been built as some of the most advanced, and they can often reach speeds of up to 70 miles per hour. In some cases, they have even gone up to 100 miles per hour when doing dives. When you fly this drone, it often feels like you sit inside it, and these drones get flown for competitive races. With drones, after you get past the beginner stage, the most important feature to look for when looking for the best drones under $200 will be extended flight time. It's never fun having to call it quits early because you have to charge your drone. The flight time on drones can be anywhere from five minutes to 30 minutes, but the beginner drones usually only last for 10 minutes. A longer flight time will also mean that you can do more things with your drone. You will want to keep extra batteries on hand as you're flying them because you can switch one out as it runs low on batteries. Keep in mind, the more expensive and fancier the drone, the more you will pay for each battery. A drone with a good range will be the key to exploring and seeing new things. Drones can get a range of up to 7,600 yards, but some of the beginners will only get between 55 to 110 yards. Anyone who wants top-notch footage or a racing drone will need to get a drone that has a longer range. 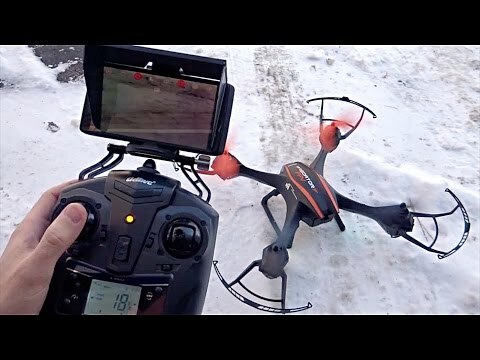 One of the most important features of a drone, headless mode makes piloting a drone much easier, especially when you're a beginner. Let's say you began with flying the drone away from you, but then you flip it 180 degrees and fly it toward you. Now the head faces in the opposite direction, and if you hit the stick left, it will move right or the opposite, which can especially confuse the beginners. So this is a must have for the at this price range. Drones don't have the appearance of planes, and they can be hard to identify with the head and the tail. It takes practice, and you will most likely get confused at times, but headless mode means that when you move the stick left, it goes left. It keeps the flight of the drone simple. With the simple pressing of a button, the drone will fly back to you. However, a more expensive drone will usually have more advanced features on it. One of the examples of this is obstacle avoidance. When drones don't have GPS, they will simply continue to move backward whenever you hit this button. Basically, you want to make sure you have set the drone in headless mode so that it doesn't take backward as a variety of directions. Especially if you want to snap great video footage or photos, a gimbal will keep the footage from being wobbly. Whenever you change direction with your drone and tilt the drone without a gimble, you see shaky footage that can be hard to follow. For those without a lot of experience in flying, gimbals are essential if you want to produce quality footage that looks good. So this is another must have for the this level of drone. For anyone who lives in the US, they will need to register their drone if it weighs over 55 pounds. Luckily for beginners, most beginner drones don't weigh more than this, and you won't have to worry about doing this when getting started. Also, never fly your drone out of your line of sight. While a first-person view might make it tempting to fly it out of view, but when you can't see it with your own two eyes, it can be harder to avoid obstacles. These are some tips to keep in mind when getting a drone under 200 dollars. They are some of the things that you should look for to get the better deal. As a beginner, you will most likely start with a beginner drone, which isn't a bad idea. While the cheaper drones don't have as good of cameras, it gives you experience with flying them, which you can later use to upgrade to one of the better drones. In conclusion, UAV's can be a very entertaining hobby. Although many drones are very expensive, you can still purchase a great quad at a reasonable price. If you are looking for professional quality for film making or something similar you will need to spend a bit more money but you can find several quadcopters of good quality that will meet your recreational needs. The devices in this price range will get you a decent drone to start out on and you will be able to capture both video and snapshots. You can't go wrong purchasing any of the quadcoptors on this list. 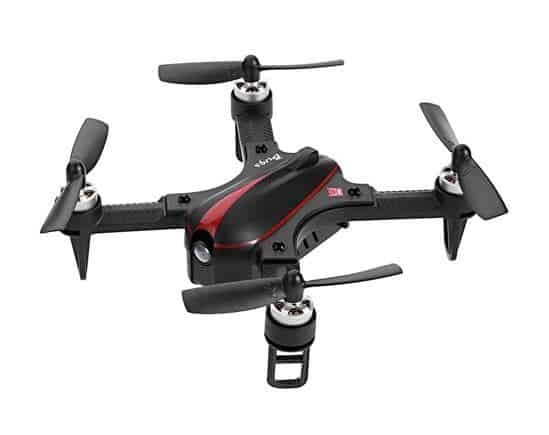 In fact the quads mentioned in this list are some of the best quality drones you can find that are affordable and this price range. If you are looking for something with little higher end check out our drones you can get for less than 300. If your budget is not quite this high you can check out drones that can be had for less than $100! Still have questions about purchasing the best drone under 200? Have a better choice in this category? Let us know down below in the comments section below. "Farming" by Mauricio Lima is licensed under CC BY 4.0 is the featured image in this post.